MYERSTOWN – Sometimes growing up, adolscents struggle with things like confidence, self-esteem and outside influences. 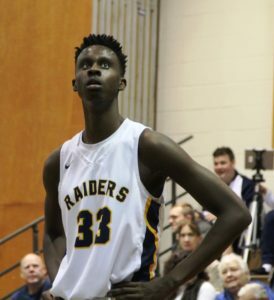 In the case of the Elco boys’ basketball team’s true identity, one needs to look only as far as the win-loss ledger. For the Raiders are, who their record says they are. 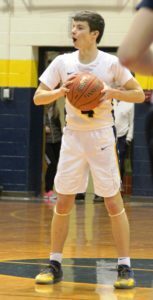 On Tuesday night at home, Elco padded its seasonal resume with a 42-37 come-from-behind triumph over Octorara. 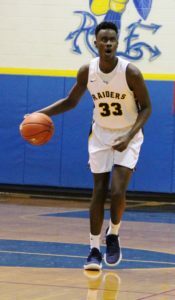 While they navigated some shaky moments throughout, the Raiders started strong and finished stronger. 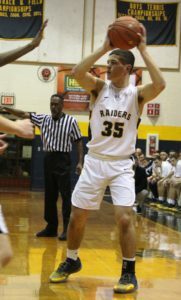 The late-season result propelled the Raiders to 10-7 overall, 6-3 in Section Four of the Lancaster-Lebanon League and solidified their standing for both the league and District Three Class AAAA playoff tournaments. 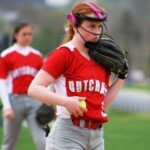 Octorara, which had handed Elco a 54-50 setback on January 4th, fell to 9-7 on the year and 5-5 in the section. 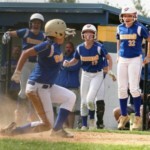 “Looking at the schedule at the beginning of the season, I think we’re exactly where we thought we’d be, record-wise,” said Elco head coach Brad Conners. “Looking back, there’s probably a couple we could’ve had, and you could kick yourself. But we’re in the hunt, and there a couple of different things up for grab. Last night certainly wasn’t Elco’s finest performance of the season. But when the outcome was hanging in the balance, the Raiders seemed to flip a switch and make all the plays when they needed to. Trailing 35-34, a Braden Bohannon three-pointer with 1:55 to go gave Elco the lead for good. 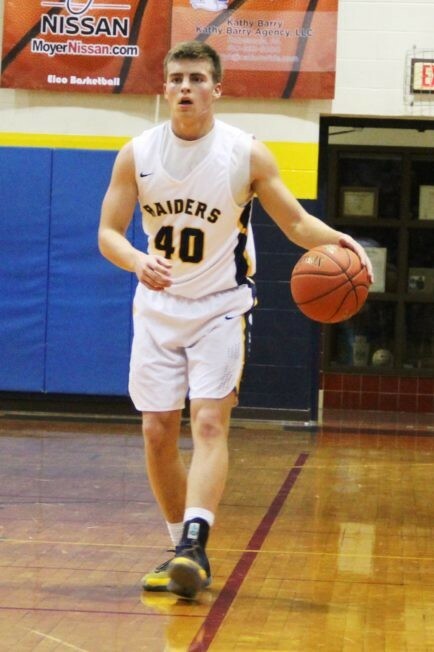 Thrity-seven seconds later, Bohannon converted an old-fashioned three-point lead to give the Raiders a 40-35 lead, and then Asher Kemble all but iced it with an inside bucket, with 38 seconds remaining. 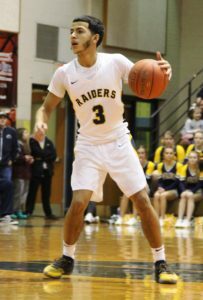 But even before their late flurry, Raider Jordan Fernandez had knotted the score at 32 with a three-pointer, just ahead of Evan Huey’s driving lay-up. “The Bo three on the sideline, coming off a screen, was big,” said Conners. “I knew he was going to shoot it, and I knew he was going to make it. There was a huge defensive play by Asher, he sent Huey ahead and he finished. And there was Bo’s ‘And One.’ We had a lot of different guys make plays down the stretch. 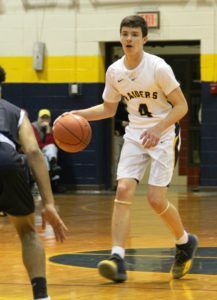 After struggling offensively for most of the first half, Elco went without a point for the first three minutes of the second half. 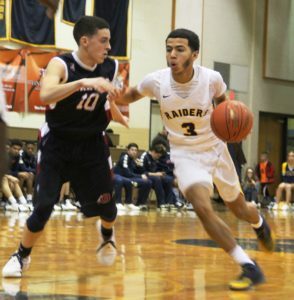 It was 21-14 Octorara, before Kemble knocked down a jumper, Fernandez scored on a put-back and Bohannon scooped in deuce to pull the home side to within a point of the lead. “We found a way,” said Conners. “It’s like feast or famine right now for us offensively. But our defense gave us a chance to win. 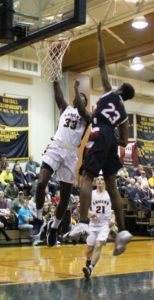 With 13 points, Bohannon garnered team-high scoring honors. 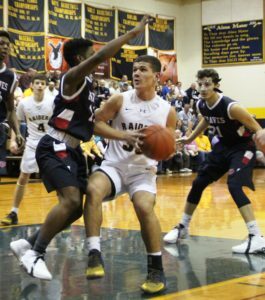 The Raiders made all four of their free throw attempts and outscored the Braves 12-3 from distance. 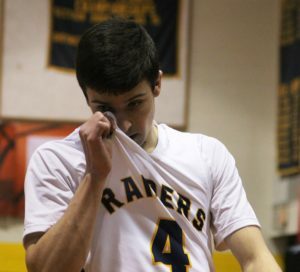 Elco started the game on fire and threatened to run Octorara out of its gym. The Raiders held the Braves without a point for the opening 6:09 of the contest. On the other end of the floor, Elco was getting five points from Bryce Coletti, a Bohannon triple and a drive to the bucket by Fernandez to open a 10-0 lead. In the second period, it was Elco’s turn to go seven minutes without a score. The resulting 10-0 Octorara run tied the game at 12, and the Braves led 15-14 at the intermission. 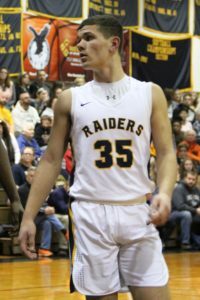 To purchase images in this article email jkfalk2005@yahoo.com, or to view more go to https://lebanonsportsbuzz.com/photo-gallery/. 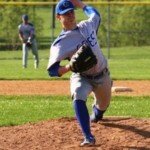 Which Lebanon County Baseball club will win the most game this spring?